Some might call it strewing. Still others prefer "childhood enchantment." Whatever the moniker, the outcome is still the same. All of these methods lead to one thing, a delight-directed education. It's the no-fuss, fast-track way to encourage REAL learning...the kind in which a child personally invests and one which inspires (not requires) him to want to learn more. But what exactly is "strewing?" you ask. To be honest, it's kind of an If-you-give-a-Mouse-a-Cookie story line. When strewing, you use a pre-existing interest or passion to lure your child into another interest or passion. One topic leads to another, which leads to the next, which leads to the next. Now, I could just let him continue to build his Lego army in solitude, naively assuming he's preparing for some kind of brick apocalypse, OR I could use this pre-existing passion of Legos to lure him into learning. I'll take door #2, please. And here's where the strewing comes in. I lay out some headphones and a few Heirloom Audio Adventures and casually mention that he can have some time to listen to a CD all on his own...while he plays with Legos, of course. 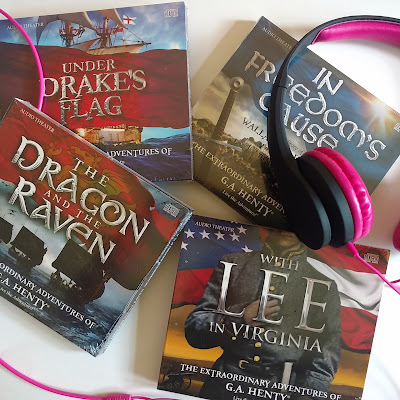 He sifts through the available titles I've tossed his way...Under Drake's Flag, In Freedom's Cause, The Dragon and the Raven...and chooses With Lee in Virginia. A few minutes into the series, he realizes that this is the very same LEE that I had mentioned when I came back from a whirlwind trip to Washington D.C. and Gettysburg, Pennsylvania a few weeks prior. He had listened intently then. But now after building and listening and building and listening on and off for the entire 2 1/2 hour drama, he's mesmerized. He rushes up to the family library and begins culling a stash of Civil War related books for himself. The next hour finds him lost in a literary retelling of Lee and Grant and their opposing armies. Somewhere in the mix, he lands on Lincoln. He learns of his presidency, his obsession with cats, and his insatiable appetite for chicken casserole...little known facts that he learns from a presidential trivia book. This new found, and somewhat whimsical, knowledge of Honest Abe leads to a new topic of table conversation...oddities of presidents past. While lingering over lunch, we all discuss the fact that the "S" of Harry S. Truman doesn't stand for anything. The 33rd president never actually had a middle name. We speak of 350 pound William Taft and the bathtub "incident" of '09. And praise Ronald Reagan for the birth of the blueberry flavored jelly bean, made in his honor. With heads full of presidential potpourri, my kids do a quick meal cleanup, then clamor to the game closet. All five of them launch into a heated game of Hail to the Chief, a homemade game of presidential facts that my daughter created for one of her PBL presentations a few years back. When the final question is answered, the money tallied, and a winner declared, the kids all scatter and the presidents are forgotten. And my son? The one who started this delight-directed adventure in the first place? Well, he heads downstairs to do what he does best, build Legos. Only this time, he decides to pop on another Heirloom Audio Adventure. Before you know it, we're all discussing the Vikings and their European invasions. And that, my friends, is the lazy momma's way of directing a delightful education. Oh, what a splendid blog post!! I could just envision all these things happening in your family, and it made me smile. 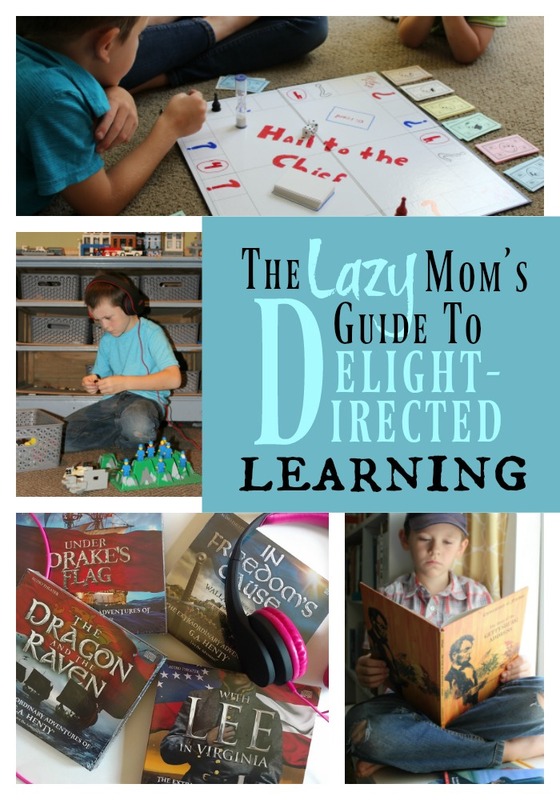 Thank you for this great example of delight-directed learning in your homeschool. This was an amazingly written post! Had me on the edge of my seat, probably like your son has been with his trail of learning. I will be trying this with my boys...6 and 14. I love to "strew"! I would like to add some audio books and cd's but don't have anything for the kids to listen to them on. Do you have a cd player good for kids that you recommend? Thanks! We just bought a cheap one-disc CD player at Walmart. There's really very little to do except put in the CD and push play. I love this. 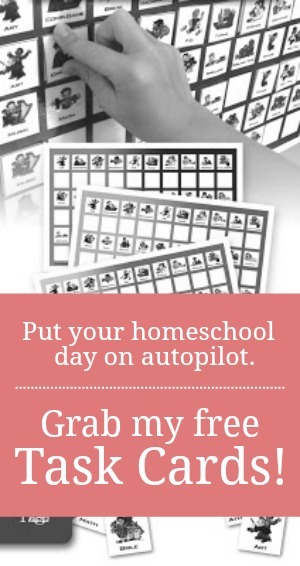 When did you change to a delight-directed home school? I used to read your blog all the time. Just got away from it and videos because I started playing the comparison game and losing. I'd love to go back to some of your blog posts from the transition. 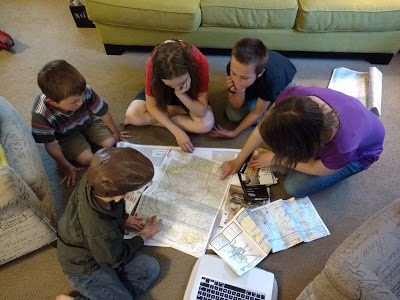 I'm trying to trust letting my son lead. I hope I'm not mixing you up with someone else, but I thought you have workboxes and more curriculum in the past. I've always been eclectic, Rhonda. I do use traditional curriculum, but I also make up my own unit studies, strew a lot of delight-directed learning...along with snippets of lots of other methods. I don't exclusively belong to any method or style. I talk about it most in this post. Okay, thanks. I know you've been eclectic. Actually your YT channel was the first one I watched and felt empowered to be able to do some things in a non-traditional way. I have a 4th grader. I've been feeling like we're doing too much these days (as we started back in early July). I like the schedule you have for your son. I need to allow myself to cut back on social studies and science. I'm glad I'm following you on Facebook or I would have missed strewing. :) Be blessed!